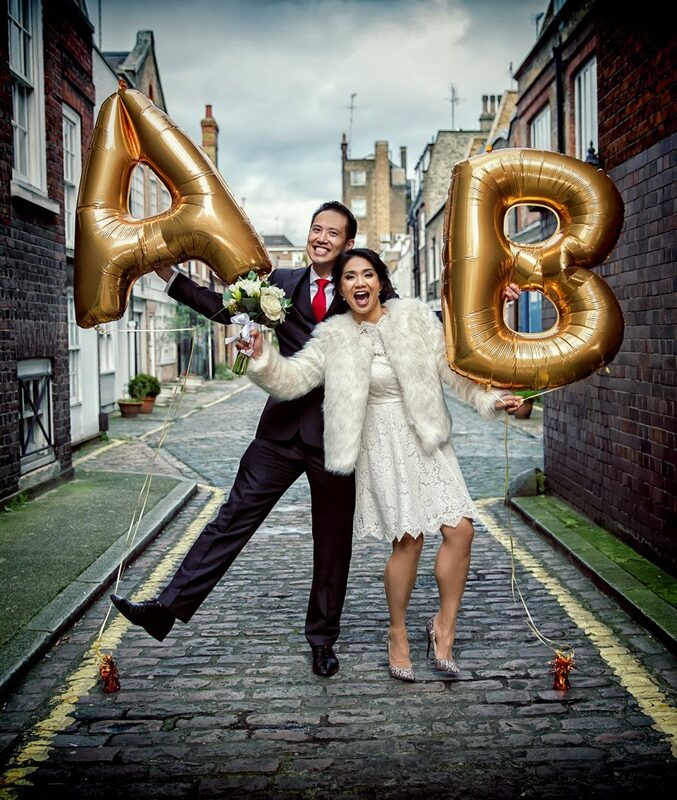 We first met Barbara and Andrew on a Skype video call, as is the case sometimes when couples have very busy schedules and travel extensively. 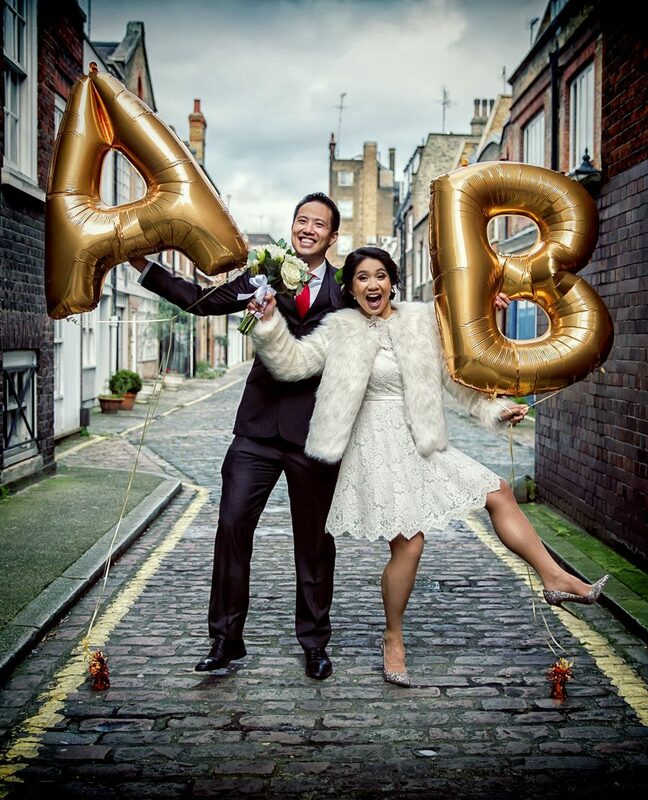 However all of us knew pretty much straight away that we were a good match for each other, and it wasn’t long before our coverage of their wedding day at Asia House and reception at Sketch in central London was confirmed. We always look forward to a big day as it is a creative thrill to capture and help create images that are going to be looked at and loved for generations. So 7am on a Sunday morning our alarm clock rings, and it is time to grab a quick coffee and toast, and head into Marylebone for Barbara’s wedding prep at the aptly named Marylebone Hotel. 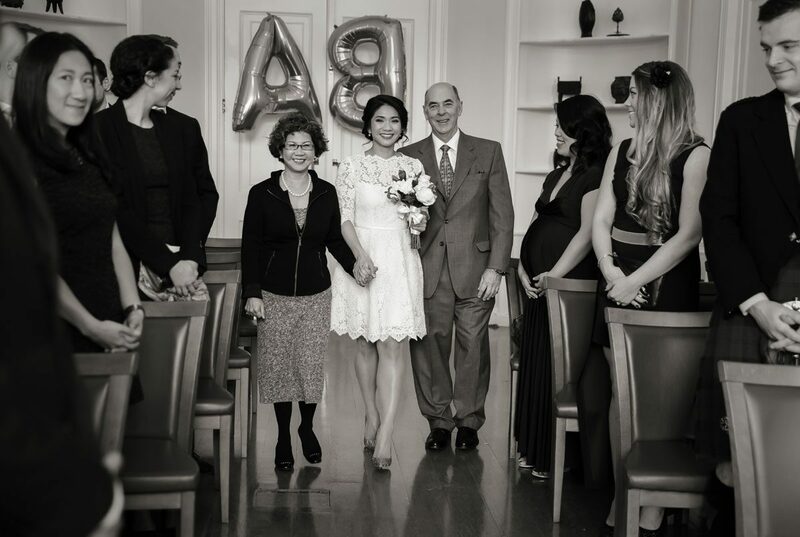 As Asia House was the venue for the civil wedding ceremony and it was only literally a few hundred yards around the corner, I improved my fitness levels by jogging between there and the hotel. I wanted to capture Andrew and his families arrival, but also keep an eye on how Barbara was getting on back at the Marylebone. I was definitely the best dressed jogger that chilly Sunday morning! Asia House itself on New Cavendish Street was built in the 1770s and is a lovely grade II Georgian listed building. The ceremony took place on the first floor in what the venue calls “fine room 2” and it certainly was a very fine affair too! 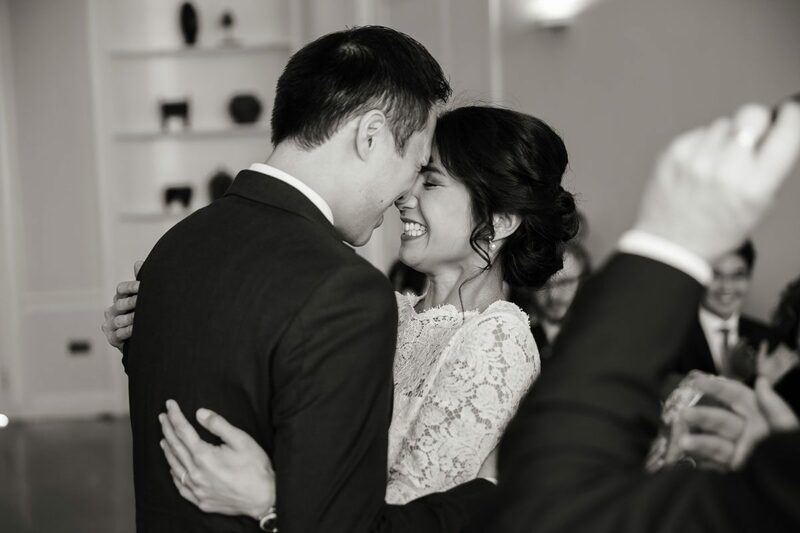 Barbara and Andrew during their marriage vows were what I would describe as a “photographers dream” in the sense that they were expressive, looked at each other lovingly, but also found time for laughter and interaction with their wedding party during the vows. Having said that, in terms of photography it still takes discretion experience and skill to capture unrepeatable moments well. 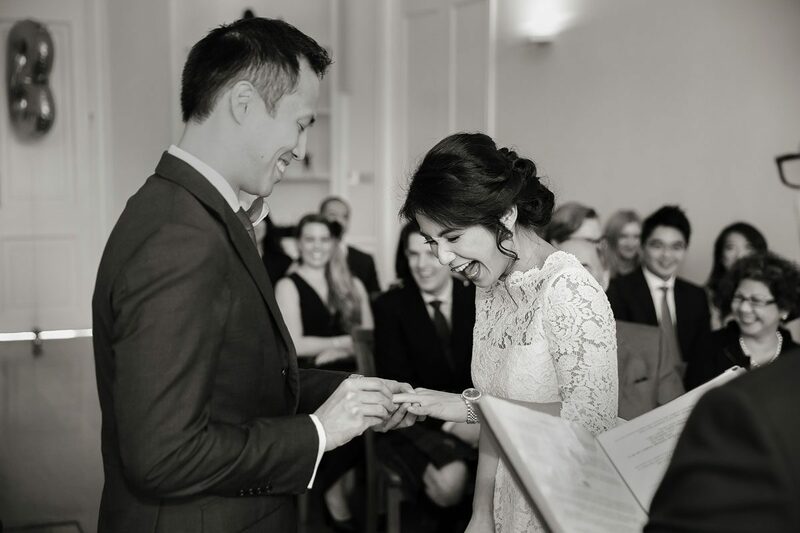 A special mention for the registrars, as we have consistently found with all central London wedding officials, that they were relaxed friendly and very good at what they did. It really does makes a big difference to the feel of a wedding ceremony to have sensitive and aware registrars conducting the proceedings. 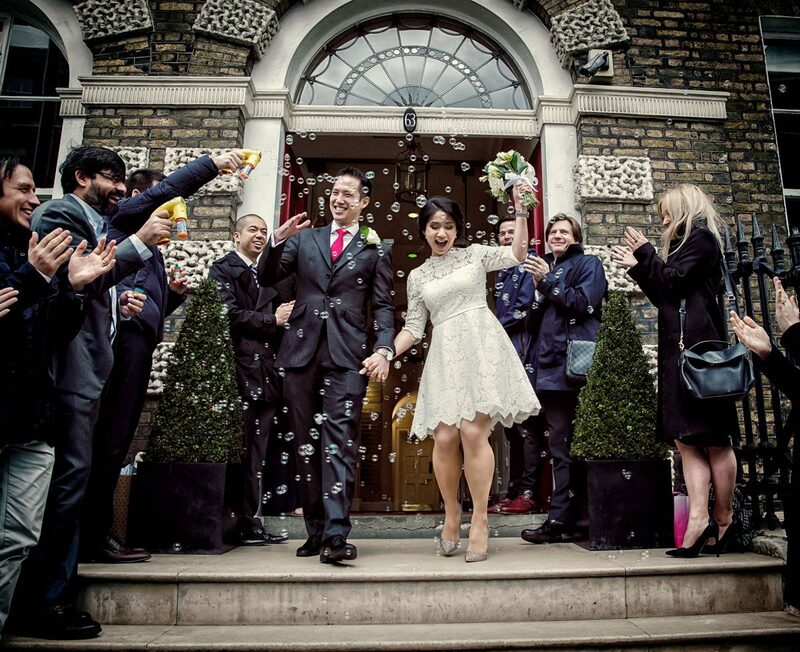 It was soon time for the newlyweds to wave goodbye to Asia House through a sea of soap bubbles on the steps of this fine Georgian venue. Bubbles by the way are a great alternative to confetti if a particular venue does not allow it, and I have wrote an article about this on Wikipedia of all places recently. By the way, banning confetti is not because the venue is mean or lazy, it has more to do with the local goverment littering rules of the area they are in! 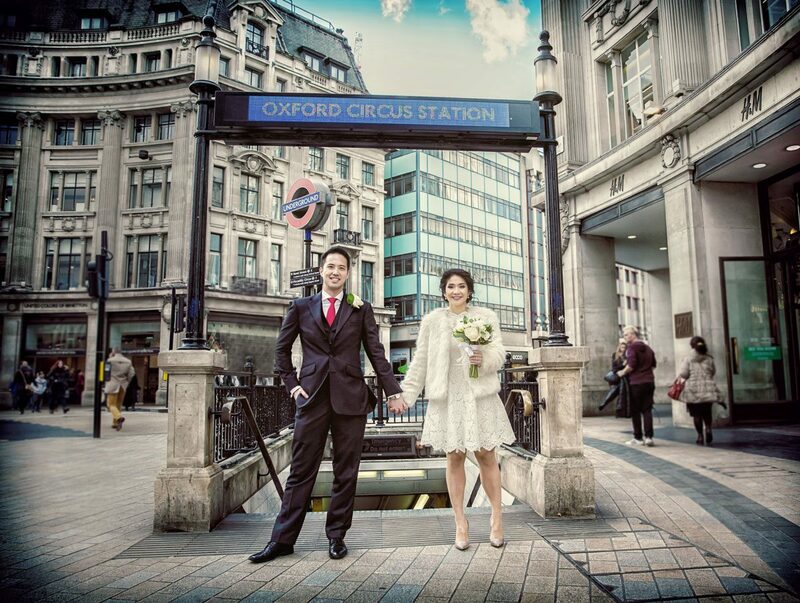 The wedding party now made the fairly short journey across the centre of the capital past Oxford Circus to the reception venue Sketch on Conduit Street. It was in this twenty minute period that myself and Joanna stopped off a couple of times on the way to take shots of Andrew and Barbara on their own. 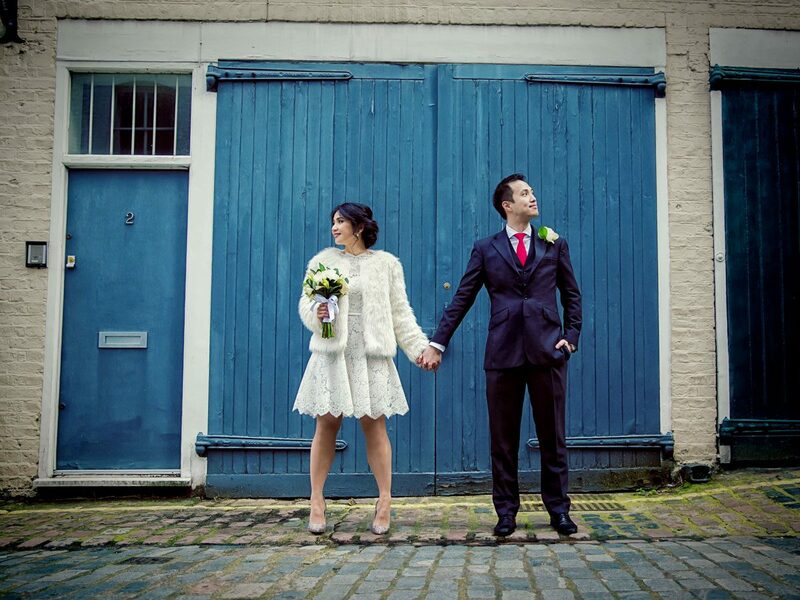 We are very adept at spotting locations and photographic opportunities, and used a mews nearby to start our shoot. We also took in some Georgian railings and Oxford Circus itself on the way too. 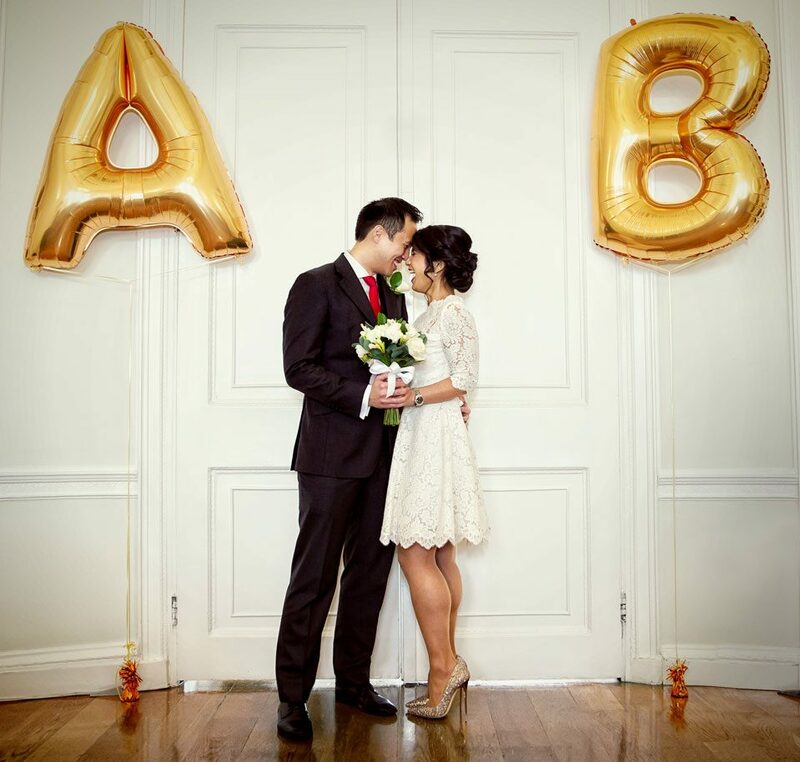 The couple had two fantastic gold balloons with their initials on for the day that we simply HAD to put in some of the shots, they certianly were a nice bonus prop to utilise for photos. Sketch, what a venue, quirky, classy with a real variety of internal locations. Yet another fine example of an eighteen century classic London building. Speaking to the staff inside they say they are always trying to keep the look fresh and ever evolving. The venue is Time Out Recommended like ourselves. In fact Sketch is as much a gallery as a restaurant, and has the most amazing toilets! 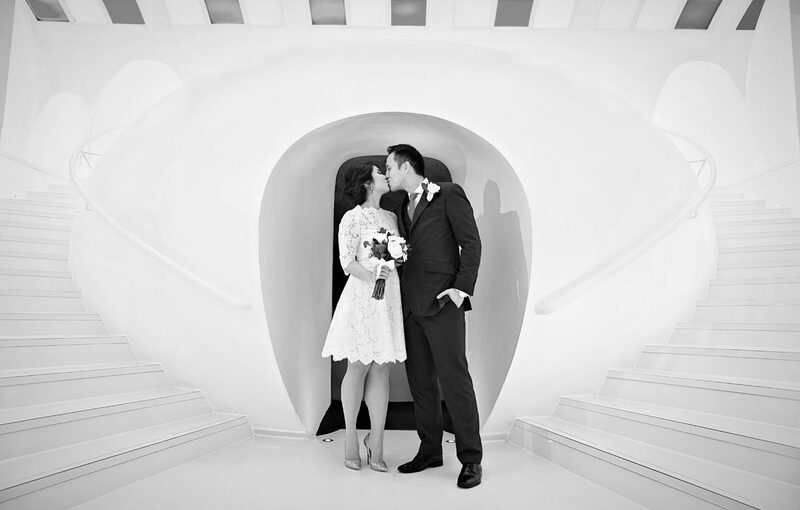 Now I don’t think we have ever mentioned toilets in a wedding day blog post before, but these are a series of white pods in a wonderfully futuristic space that we just had to photograph the couple in. Food and service at Sketch was magnificent, and was a wonderful way to round off a lovely and memorable wedding day. Special mention to Barbara and Andrew’s friends and family who were delightful to work alongside and spend time with.